May 15 (teleSUR) When the Venezuelan elections are held on May 20, much of the world’s media, trailing the U.S. Department of State, will have already denounced the elections as “non-democratic” before they have even taken place. However, when the National Electoral Council (CNE) actually called said elections, these same voices changed their tune. The charges are rather predictable. But is the United States really the model democracy it claims to be? US: Liberty and Justice For All? While repeatedly claiming to be the caretaker of “democracy” and actively justifying its invasions and interference in other countries and their internal affairs as “spreading democracy”, a look at the United States own system of elections as well as the history of its foreign policy regarding elections reveals a significantly different reality. The United States has throughout its history, disregarded the right of people around the world to choose their own leader in a democratic way, and has used its immense economic, political and military weight to depose elected leaders in Latin America, including in Paraguay, Brazil. Argentina, Bolivia, Chile and Granada. The lack of respect for democracy extends within the United States’ own borders as well, so much so that President Donald Trump is currently sitting in the White House, after having lost the popular vote which has no value over how U.S.president secure the White House. Even though a majority of election participants voted against Trump, like George Bush before him, he was able to slip into the job through a controversial electoral college victory, an antiquated institution that over half of U.S. citizens disapproved of in a Gallup poll in 2016. In the U.S. the electoral college system determines that more populated states have more electoral votes, but many states have a winner-takes-all policy, which means that if a candidate wins the majority of the popular vote in a state like Ohio, those who voted for the other candidates lose their voice in the electoral vote which in turn means discarding millions of people who voted. Also the election system in the U.S. presents obstacles in the way of voters and ultimately discourage those eligible to vote from going to the polls. Voter participation hit a 20-year low in 2016, with only 55 percent of eligible voters actually showing up to the polls. In the United States, election day is not a national holiday and is often held on weekdays, meaning that many find it difficult to even make it to the polls. Vote turnout tends to be lowest among the working classes as well as minority populations for many reasons. For example several U.S. states have approved voter ID laws that see many marginalized groups in those states unable to register due to lack of an ID. The United States does not have a national ID system and thus a driver’s license or a student card, at least in some cases, is used as an identification document. Working class people, which includes a high percentage of Black people and Latinos, lack such documents and thus are unable to vote in Republican states that have approved such laws. Some states even struck down student IDs as valid for voting. Therefore it is no surprise that when the Public Religion Research Institute (PRRI) polled U.S. citizens in the months before the 2016 elections, the results were not what one would expect from a healthy democracy. Sixty-one percent of respondents didn’t feel either major party represented them. Abroad the United States also has a long history of backing undemocratic and dictatorial regimes. After the Central Intelligence Agency (CIA) deposed socialist Chilean President Salvador Allende in 1973, it backed military dictator Augusto Pinochet, responsible for mass political persecution, pushing the Communist Party of Chile underground, and forcibly disappearing thousands. 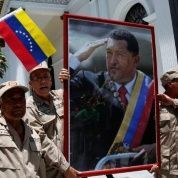 Since former President Hugo Chavez assumed the presidency in 1998, on a wave of support from the working classes, Venezuela has had 25 elections, five of them presidential. Of these elections, the opposition and their allied media have cried fraud every single time, except for the times that they won. Chavismo allied forces have lost twice, and the results were recognized and honored each time. Do dictatorships let their opposition win? Unlike the United States, Venezuela has consistently high voter participation, with roughly 80 percent turnout in 2013’s presidential election, which is among the highest of any country in the region, save Cuba. Venezuela’s voting system incorporates the latest technology, making use of biometric technology to activate voting machines, carrying out a paper ballot audit of the electronic votes, and transmitting electronic votes through a fully encrypted and isolates network. The process is fully auditable at every step of the process. Moreover the 1999 Venezuelan constitution has included articles that allow for a “recall referendum” as a way in which the country’s president, as well as any other elected public servant, could also be challenged between presidential elections through a popular consultation. In fact the Venezuela opposition used this article in 2004 against late President Chavez when it managed to get the amount of signatures required and people went to the polls on June 8 of that year. The result denied the opposition their wishes with 58 percent voting against removing the socialist president. And just as in every single previous election and referendum, the National Electoral Council (CNE) has invited all international observers to oversee the process, including the United Nations and the Caribbean Community (Caricom). Democracy in Venezuela was transformed with the rise of the Bolivarian Revolution. With Chavez, for the first time in the country’s history, a political force that truly represented the will of the people came to power, and communities became active participants and builders in constructing their nation. Most exemplary of this participatory democracy, was the concept of the commune, or organized communities, which became the defining feature of the movement. The result has been a political process and sense of democratic participation that has firmly embedded itself in the daily life and culture of the country, something the United States has a long way to go to achieving. Grassroots organizations and organized communities are powerful agents of change in Venezuela. Those who effect change at the local level are given representation at the national. This was exemplified in last year’s constituent assembly elections, when representatives were chosen to bring together workers unions, womens organizations, peasants, neighborhood assemblies and and businessmen. As in any democracy, the outcome of the elections on May 20 is still uncertain, and a great deal is at stake regarding the path the country will take. What can be said with confidence however, is that when Venezuelans go to vote, they will do so as a people with deeply seated political agency and sovereignty. The United States has a lot to learn.